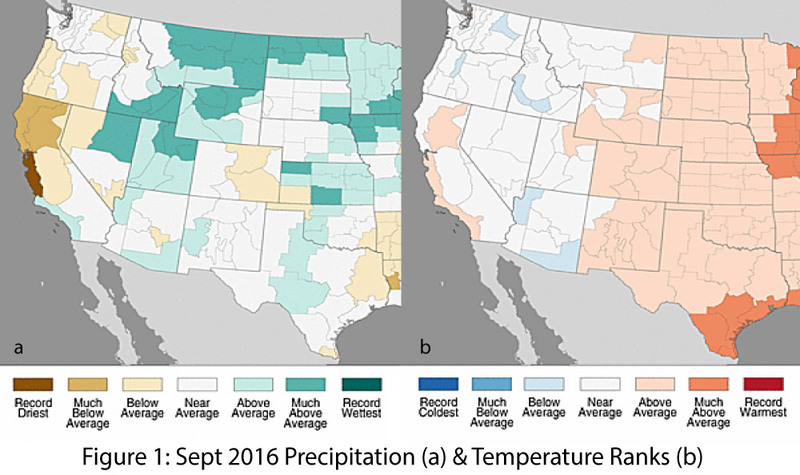 Precipitation and Temperature: September precipitation totals were near average across most of the climate divisions in Arizona and New Mexico (Fig. 1a), with one notable departure being the swath of above-average precipitation in the borderlands region linked to Tropical Storm Newton. 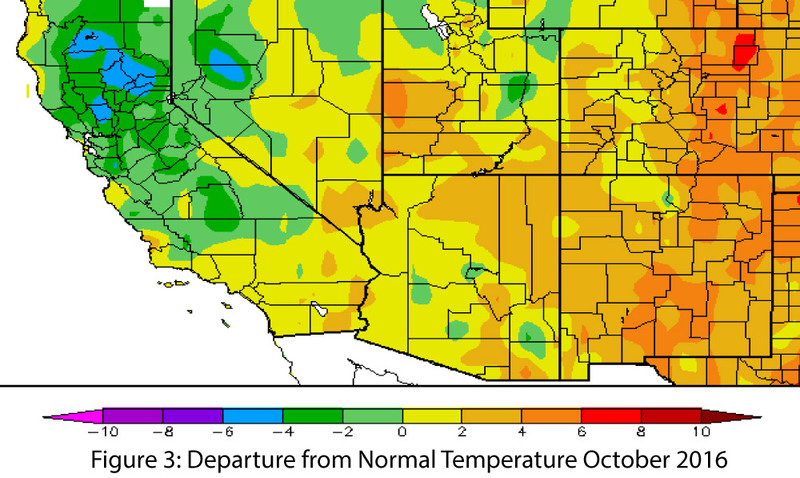 September temperatures were average to below average in Arizona and average to above average in New Mexico (Fig. 1b). 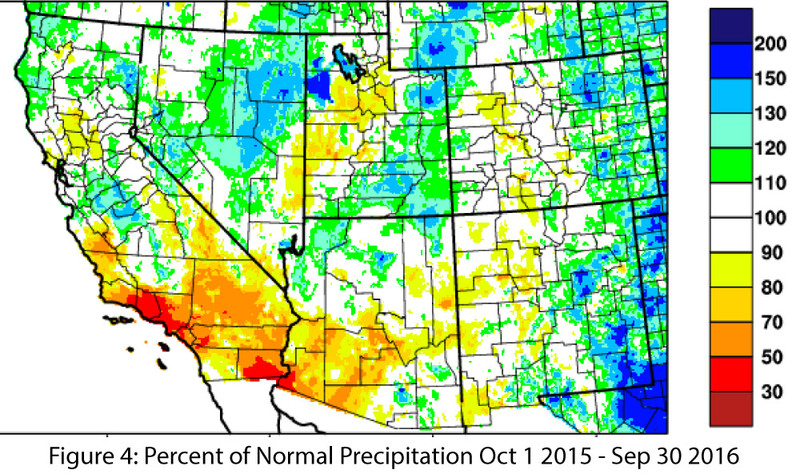 October precipitation to date has been below average across most of the region (Fig. 2), although October is one of the drier months in the Southwest, so dry conditions are not unexpected, and a single tropical storm or fall storm can skew the percent of normal. October temperatures have been 2 to 6 degrees above average for most of New Mexico and 0 to 4 degrees above average for most of Arizona (Fig. 3). This is in part connected to global trends that are likely to see 2016 as the warmest year on record (breaking the record set in 2015). Monsoon 2016: Precipitation totals (June 15 – Sept 30) were generally below average across much of Arizona except for the southeastern and northwestern corners of the state (see Fig. 2a in Monsoon Recap). New Mexico saw more uniform coverage and average to above-average totals, especially in the southern half of the state (see Fig. 2b in Monsoon Recap). A number of weather stations in the borderlands region of the Southwest recorded well-above-average seasonal totals (e.g. Tucson, Safford, Douglas, Animas, El Paso, and Van Horn), while central areas (e.g. Albuquerque, Phoenix, Los Alamos) saw average or even below-average totals (see Southwestern Monsoon Recap for more details). 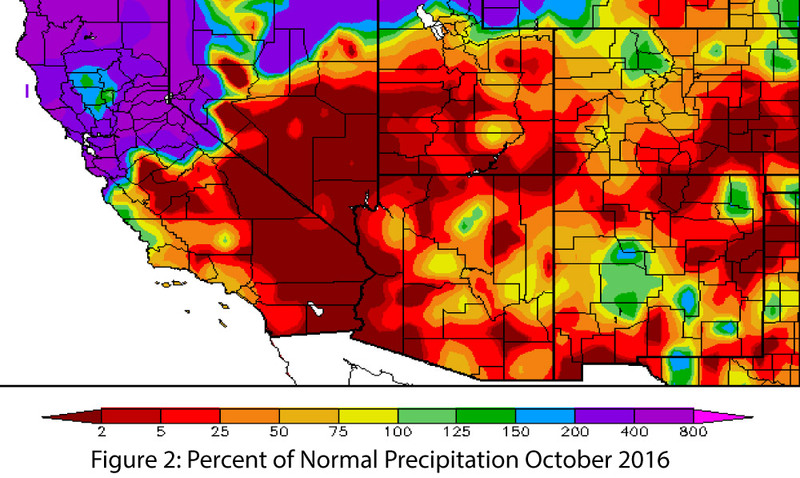 Drought & Water Supply: Water year precipitation to date (Oct 1, 2015 – Sept 30, 2016) was below average in much of the Southwest, particularly in Southern California, most of southern Arizona, and western New Mexico, while northern Arizona and eastern New Mexico were average to above average (Fig. 4). Long-term drought conditions persist across the Southwest (Fig. 5). According to the US Drought Monitor, most of Arizona is designated as abnormally dry (D0) or experiencing moderate drought (D1), with the far southwestern corner of Arizona designated as experiencing severe drought (D2), reflecting the persistent multi-year drought conditions extending from central and southern California. 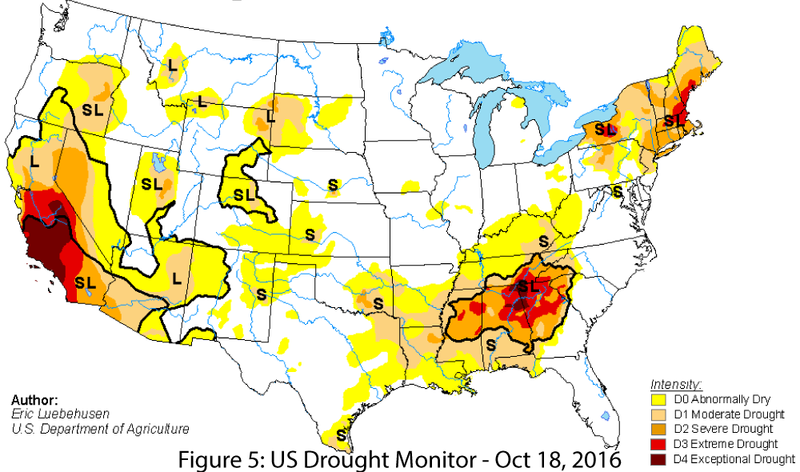 In New Mexico, much of the northern half of the state, along with the US-Mexico border region, are designated as abnormally dry (D0). There is ongoing concern that continued western drought conditions may lead to water supply restrictions (for more information see reservoir storage). ENSO & La Niña: In a reversal from last month’s forecasts, La Niña is back on the horizon for this winter. Current model consensus hovers around a 70-percent chance of a weak La Niña forming, but models and forecasts also indicate that this event could decline quickly in early 2017, which may limit its influence on weather in the Southwest. The relationship between the strength of La Niña and winter precipitation in the Southwest is relatively weak, and the Southwest is inherently dry (i.e. winter already sees relatively low precipitation totals in a normal year). Even so, the persistence and duration of La Niña conditions could increase the chance of a drier-than-average winter. This raises concern given the multi-year drought observed in the Southwest, and the possibility of water restrictions if Lake Mead drops below the 1075-foot elevation threshold. Precipitation & Temperature Forecasts: The Oct 20 NOAA Climate Prediction Center’s outlook for November calls for increased chances of below-average precipitation and increased chances of above-average temperature. 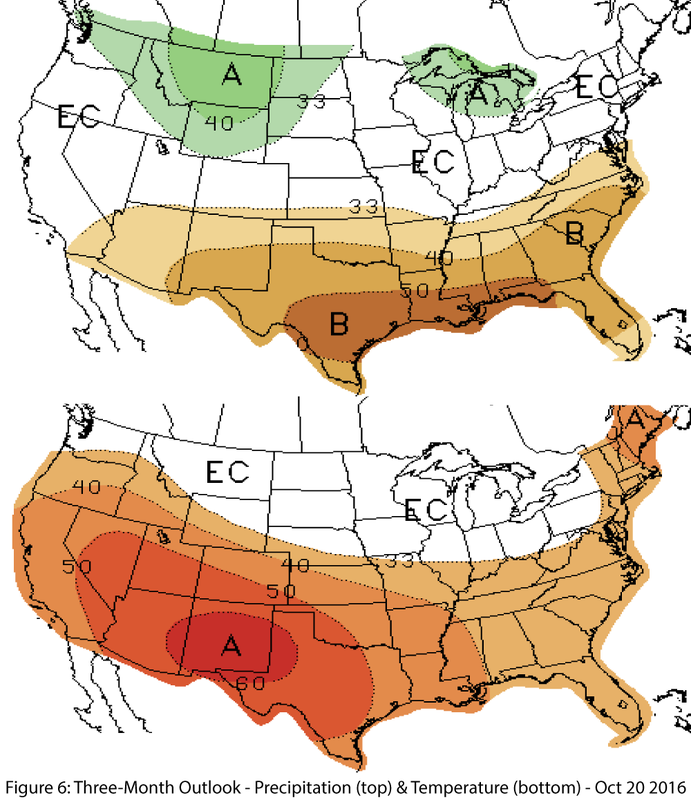 The three-month outlook for November through January calls for increased chances of below-average precipitation (Fig. 6, top) and increased chances of above-average temperatures (Fig. 6, bottom).